Fee: $30/$25 members - includes an autographed copy of Undiscovered Country, refreshments from MKE Localicious, and admission to the sculpture garden. Come early to stroll the grounds. Register by phone at 414-446-8794. 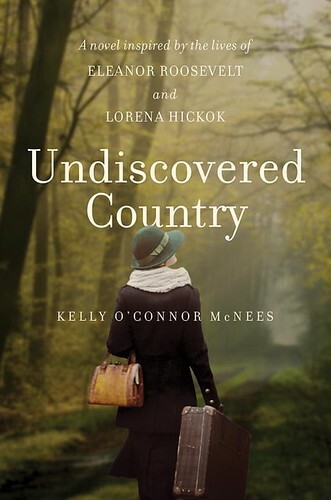 Lynden Sculpture Garden's Women's Speaker Series and Boswell Books welcome Kelly O'Connor McNees, author of Undiscovered Country, to the Lynden Sculpture Garden, Monday, September 24, 7 pm. For more information on upcoming Women's Speaker Series Events, click here. In 1932, New York City, top reporter Lorena “Hick” Hickok starts each day with a front page byline—and finishes it swigging bourbon and planning her next big scoop. But an assignment to cover FDR’s campaign—and write a feature on his wife, Eleanor—turns Hick’s hard-won independent life on its ear. Soon her work, and the secret entanglement with the new first lady, will take her from New York and Washington to Scotts Run, West Virginia, where impoverished coal miners’ families wait in fear that the New Deal’s promised hope will pass them by. Together, Eleanor and Hick imagine how the new town of Arthurdale could change the fate of hundreds of lives. But doing what is right does not come cheap, and Hick will pay in ways she never could have imagined. Undiscovered Country artfully mixes fact and fiction to portray the intense relationship between this unlikely pair. Inspired by the historical record, including the more than three thousand letters Hick and Eleanor exchanged over a span of thirty years, McNees tells this story through Hick’s tough, tender, and unforgettable voice. A remarkable portrait of Depression-era America, this novel tells the poignant story of how a love that was forced to remain hidden nevertheless changed history. Kelly O’Connor McNees is the author of Undiscovered Country, The Lost Summer of Louisa May Alcott, The Island of Doves, and In Need of a Good Wife, a finalist for the 2013 Willa Award. Her writing has appeared in The Washington Post, The Toast, and in Rust Belt Chicago: An Anthology. Born and raised in Michigan, Kelly lives in Chicago with her family. Learn more at https://www.kellyoconnormcnees.com/.